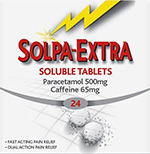 Solpa-Extra Soluble Tablets uses a double action formula – paracetamol and caffeine – to help deliver fast and effective pain relief. In particular, Solpa-Extra Soluble Tablets gets to work two times faster than standard paracetamol tablets (based on absorption data). This product can be used in adults and adolescents 12 years and over. Solpa-Extra 500 mg/65 mg Soluble Tablets are used for the treatment of mild to moderate pain, for example: headache including migraine (with and without aura), backache, toothache, muscle ache, neuralgia, joint pain, dysmenorrhea, sore throat, and for the relief of fever, aches and pains of colds and influenza. This medicine contains 427 mg of sodium and 50 mg of sorbitol per tablet. See the leaflet for further information. Each tablet contains Paracetamol 500 mg and Caffeine 65 mg.
Dissolve one to two tablets in at least half a tumbler of water every 4-6 hours. Elderly: It is recommended that frail or immobile patients should reduce the dose or frequency of dosing. Dissolve one tablet in at least half a tumbler of water every 4-6 hours. The tablet will take up to 2 minutes to dissolve.